The 2018 30th annual International Racquetball Federation – IRF World Juniors event has been underway since Saturday in San Luis Potosi, Mexico. The round robin matches are now complete and the knockout brackets are set. We’re to the business end of this tourney, so lets preview the draws and make some predictions. Draws are available at IRF’s website http://www.internationalracquetball.com/ by clicking on the event and then the direct link for draws. Follow the IRF on facebook to get notified of live feeds; Timothy Baghurst is broadcasting all day every day for a week straight and is doing a great job. Note: we only really track 16U and 18U (for now), so here’s a preview of the 16 and 18U knockout draws for both Boys and Girls. Lots of familiar names in these draws, especially for fans of international racquetball and the growing international game. In the Boys 18U, USA 18U champ and pre-tourney #1 seed Ricardo Ricky Diaz lost twice in the RRs, dropping his knock-out seed to #11 Similarly, USA #2 Dane Elkins saw his pre-tourney seed take a hit with two round-robin upsets himself. The two favorites to make the final (the two top Mexicans) Sebastian Fernandez and Eduardo Portillo Rendon both cruised through the round robins to maintain their top four seeds in the knockout phase. Predictions for the knockouts: I can see some minor upsets in the early rounds, especially with the two now under-seeded Americans, but I still see the top four seeds (the two Bolivians and the two Mexicans) advancing to the semis. In the semis, I see the two Mexican players advancing over their Bolivian rivals; Portillo over #1 seed Fernandoz Ruiz Michel and Fernandez over #3 Gerson Miranda (which would be a rematch of the 2017 16U world final). This would setup a re-match of the 2018 Mexican Junior 18U final, won by Fernandez in a tiebreaker. I see Fernandez taking this title and becoming a force to be reckoned with on the pro tours soon. 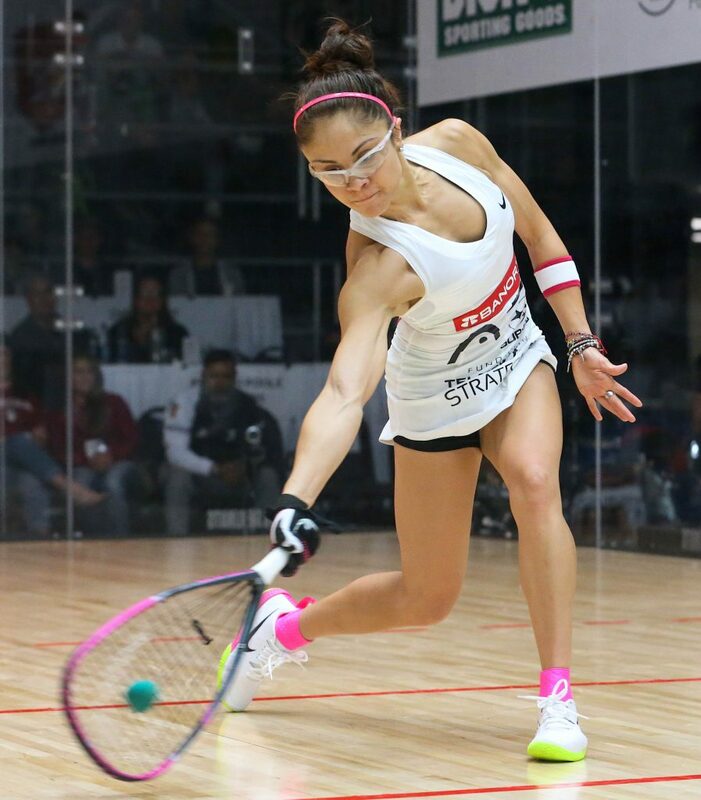 – Look for the two Americans Elyse Duffy and Graciana Wargo to advance to the quarters but run into heavy favorites. – In the Quarters, the top 3 seeds Ana Laura Flores, Bolivian Angelica Barrios and #3 Montserrat Montse Mejia should advance easily to the semis. #4 seed and current reigning adult World Champion Ana Gabriela Gaby Martinez fell to Mejia in the round robins and has to face #5 seeded Alexis Iwaasa in the quarters. Martinez beat Iwaasa at this same stage in last year’s World Juniors and should win again. – In the semis, Martinez should outlast the #1 seeded Flores to setup a rematch with Mejia of the 2017 World 18U girls final (2017 18U match report here: https://bit.ly/2RCPMVu). – In the final, I predict Martinez returns the favor and captures the first ever double-double world title of Adult and 18U. In the Boys 16U, there’s a couple of familiar names in the draw to those following the IRT this year. #2 seeded Diego Garcia Quispe played in both the Laurel event and in the US Open and acquitted himself quite well. I predict he runs to the title, defeating American Sahil Thakur in the semi and #1 seeded Mexican Jose Ramos in the final. In the Girls 16U…the two Americans Annie Roberts and Erin Slutzky have to play each other in the first knock out round, but the winner plays into the #2 seed Mexican Maria Gutierrez. It may not matter; the #1 overall seed is current reigning World doubles champion Valeria Centellas, who played 18U last year in World Juniors (as a 15 yr old) and still made the semis. I predict Centellas over Gutierrez in the final.